The ruins of Guillemont Station. Photograph from the History of the 20th (Light) Division. 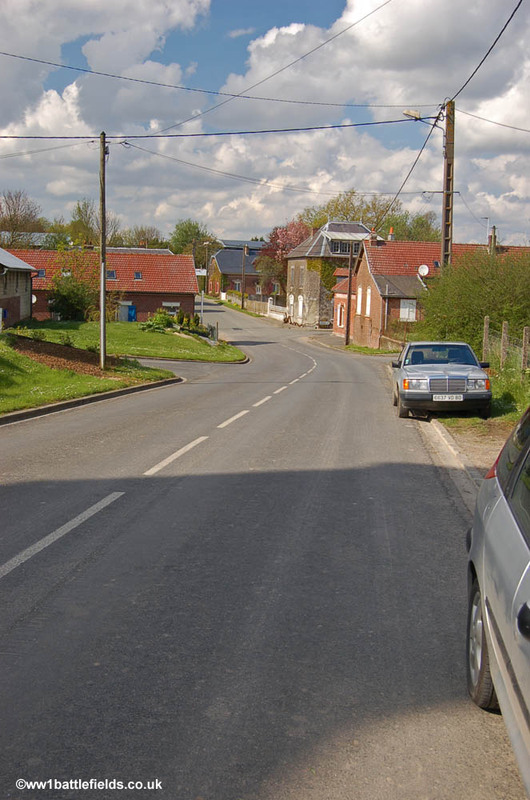 This village of Guillemont is situated about six and a half miles east of Albert, located on the junction of the D64 and D20 roads. Guillemont was attacked by the British in 1916 (on the 30th of July and the 8th of August) before the village was finally taken on the 3rd of September. The 20th (Light) Division was involved in taking the village, in the morning, their line was just to the west of the village, running past the site of Guillemont station. Assembly trenches were dug north of Guillemont Station to aid the attack, and at 6 a.m. on the 3rd of September, 1916, a bombardment commenced. The infantry attacked at noon and the attack also employed ‘push-pipes’, and liquid fire. The second objective (the eastern side of the village) was taken by 1.30 p.m., although there was fierce hand to hand fighting within the village of Guillemont itself. Attacks to the north near Ginchy were not succesful, and the Germans counterattacked at Guillemont. However, the next day (the 4th of September) the 20th Division troops pushed forwards again, and reached their final objective. They were supported by troops from the 16th (Irish) Division (who also took Ginchy on the 9th of September), and there are memorials to both Divisions in or near Guillemont. There is also a lot more to see, both in the village itself and in the surrounding area. Guillemont Station was located just to the north-west of the village, on the road leading to Longueval. 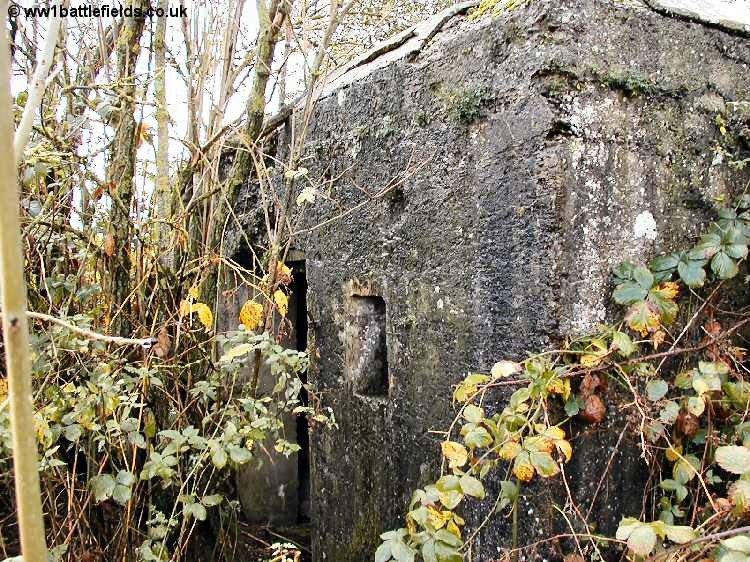 The photograph at the top of this page shows the ruins of Guillemont Station after its capture. The railway was rebuilt after the war, but is now long gone, and today grain silos are located just about where the station once stood. Just a little further north towards Longueval is the site of Waterlot Farm, another feature on the 1916 battlefield. The bitter fighting around this area is reflected in the battle debris that can still be seen today in the field edges after ploughing. Shrapnel, shell fragments and .303 cases can be seen. 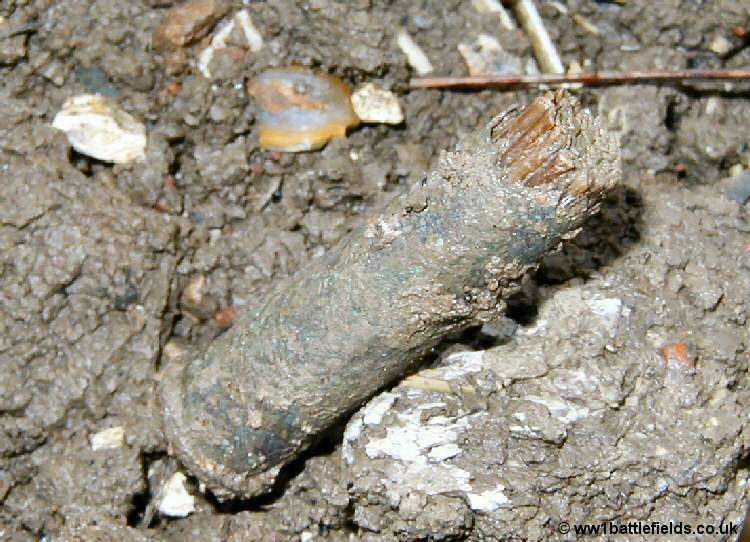 Below is a .303 round with the cordite sticks still intact inside, seen at the edge of a field near the site of Guillemont Station. 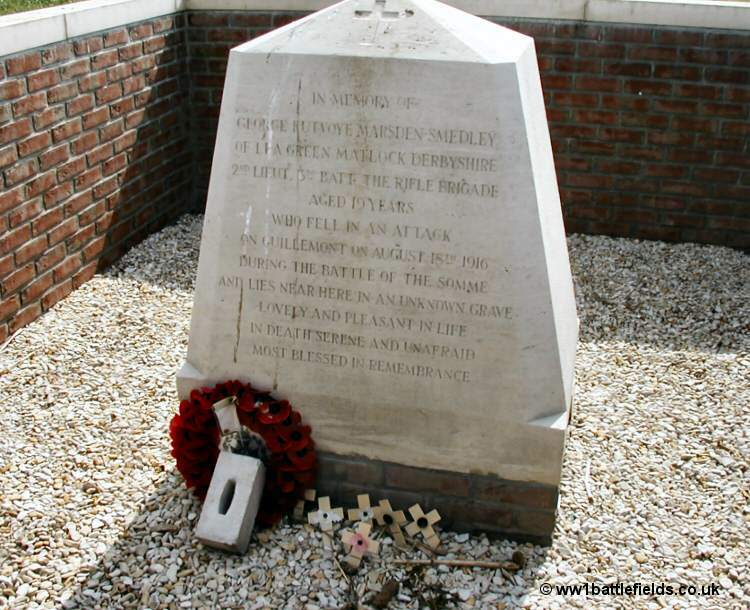 Near the site of Guillemont Station, behind the present buildings, is a memorial to Second Lieutenant Marsden-Smedley. This can be reached by walking through the yard of the grain silos. Aged only nineteen, George Marsden-Smedley was killed near here on the 18th of August, 1916, whilst with the 3rd Rifle Brigade. He left Harrow school in 1915 to join the Army. His parents purchased this small plot of land after the War, the location where he was last seen alive, and erected the memorial. George Marsden-Smedley’s body was never found, and he is commemorated on the Thiepval Memorial to the Missing. For some years after his death, notices appeared on the anniversary in the In Memoriam section of The Times. 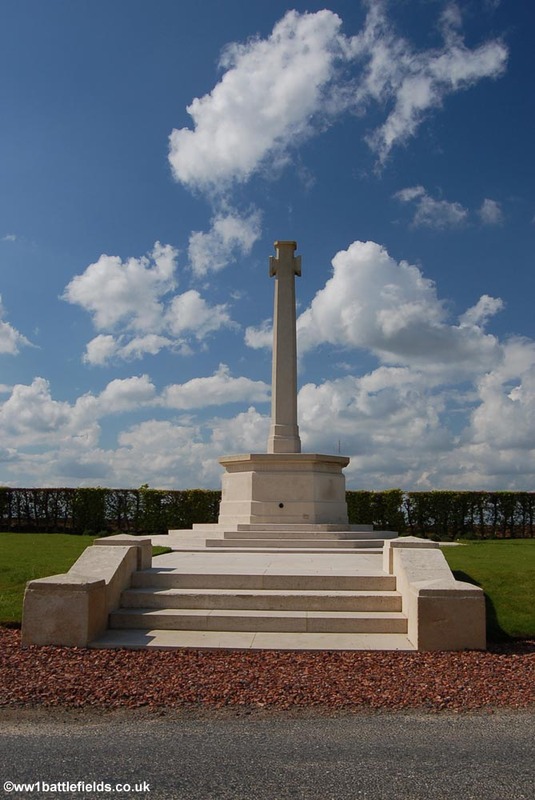 From the site of the Marsden-Smedley memorial, there are good views across to Guillemont Road Cemetery and Trones Wood. The church in Guillemont stands on the main road through the village. 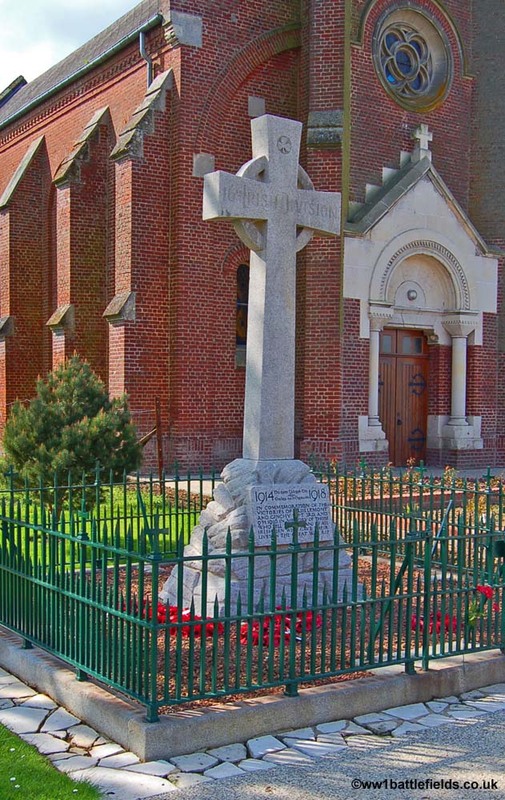 In front of the church, to the right stands the village war memorial, and one of the names listed here is Maurice Waterlot – perhaps part of the family which owned Waterlot Farm (which was located north-west of the village). The name Waterlot also appears on maps of the area today – ‘les Vingt Waterlot’ is marked to the east of the village. Just to the left of the church is a memorial to the 16th (Irish) Division. On the front of the memorial is inscribed ‘1914-1918 – In commemoration of the victories of Guillemont and Ginchy September 3rd and 9th 1916 in memory of those who fell therein and of all Irishmen who gave their lives in the great war. RIP.” This memorial is essentially the same design as the Division’s memorial at Wytschaete (a photo can be seen on the Messines page). Standing in front of Guillemont church, you can look downhill to see the D20 road leading towards Longueval; this rises uphill again from the crossroads. 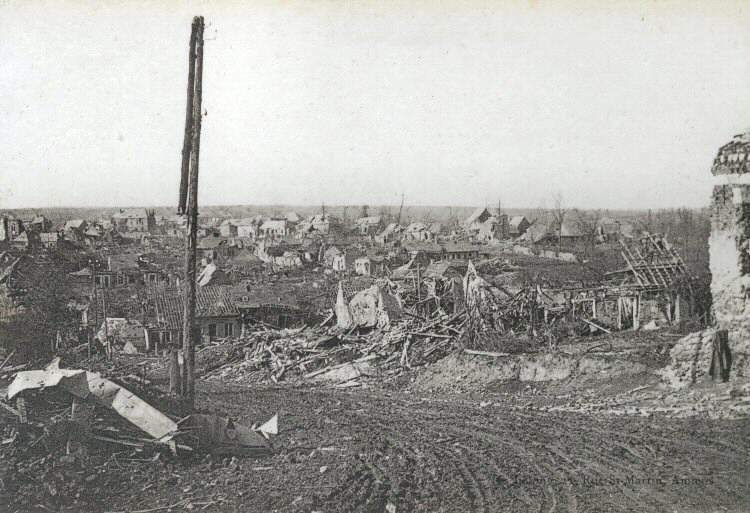 The modern-day view can be compared with a war-time picture, which shows the complete desolation of the village. The site of church is on the left as you look down the road, but only the route the road takes demonstrates that this is the same spot. If you stand with the church behind you, cross the road and then head uphill, there is a small road which leads off to the left. This is the Rue Ernst Junger, and in land off to the right can be seen entrances to dugouts. Guillemont was a German strongpoint before it was taken in early September 1916, and they had constructed dug-outs possibly as a Divisional HQ. After the war, Guillemont was ‘adopted’ by Hornsey, and in September 1921 a deputation from Hornsey visited and gave a tractor, a threshing machine and a plough to help the villagers with their return to farming the devastated land. This cemetery is located on the D64 to the west of the village. It is fronted by a low wall, and there is an imposing entrance archway. 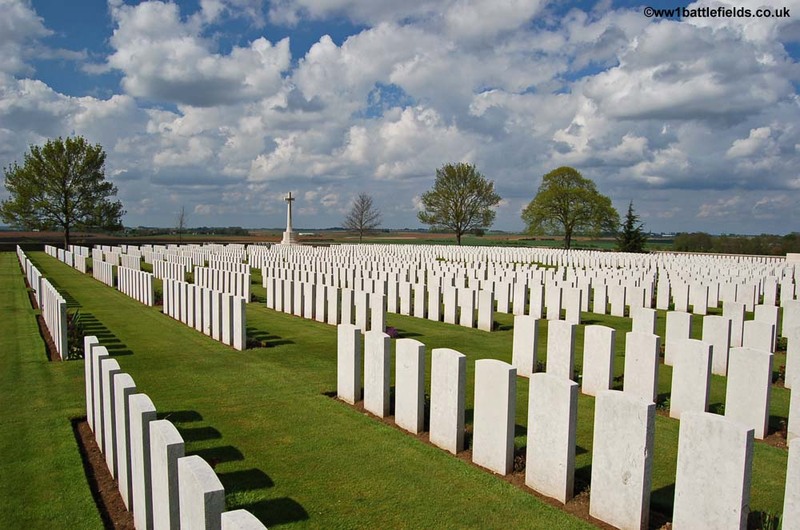 Today, mature trees line the edges of the cemetery, in comparison to a picture of the cemetery from between the Wars. The cemetery is large today, but was quite small during the war. It was started after the battle to capture the village on the 3rd of September 1916, and used until March 1917. The original ware time burials are now Plot 1 of the Cemetery. After the Armistice this was one of the cemeteries used to bury bodies recovered from the battlefields around the village. Today, there are 2,263 burials here. As with other cemeteries containing many bodies recovered after the Armistice, the proportion of unidentified burials is very high. Over two-thirds of the burials are those of unidentified soldiers. One of the graves here is that of Lieutenant Raymond Asquith, son of Herbert Asquith, who was Prime Minister at the time of his son’s death on the 15th of September, 1916. An obituary in The Times recorded the loss of ‘a man of brilliant promise’. Raymond was a lawyer and was also following his father into politics (he was the prospective Liberal candidate for Derby) when the war broke out. He applied for a commission, and served initially in the Queens Westminsters, then the Grenadier Guards. He had applied to return to the frontline from a staff position shortly before he died. The Great War is often said to have touched most families in Britain, including the Prime Minister, who lost his eldest son, and Raymond Asquith’s own family – he left a wife and three children. From the cemetery there are good views across to the village church, and also Longueval church can be seen further in the distance. The buildings on the site of Guillemont Station can also be seen, and Trones Wood is visible to the left. At the rear of the cemetery are eight special memorials to men believed to among the 1,523 unknown burials here, set four on either side of a stone bench. On the D20 leading east out of Guillemont at a cross-roads is a memorial to the 20th (Light) Division. Today, the memorial is simply a brass laurel wreath and plaque with the words “In memoriam Twentieth Light Division”, set just above the ground level. This memorial is on the line which formed an objective of the Division when they attacked on the 3rd of September, 1916. However, this is a replacement memorial. 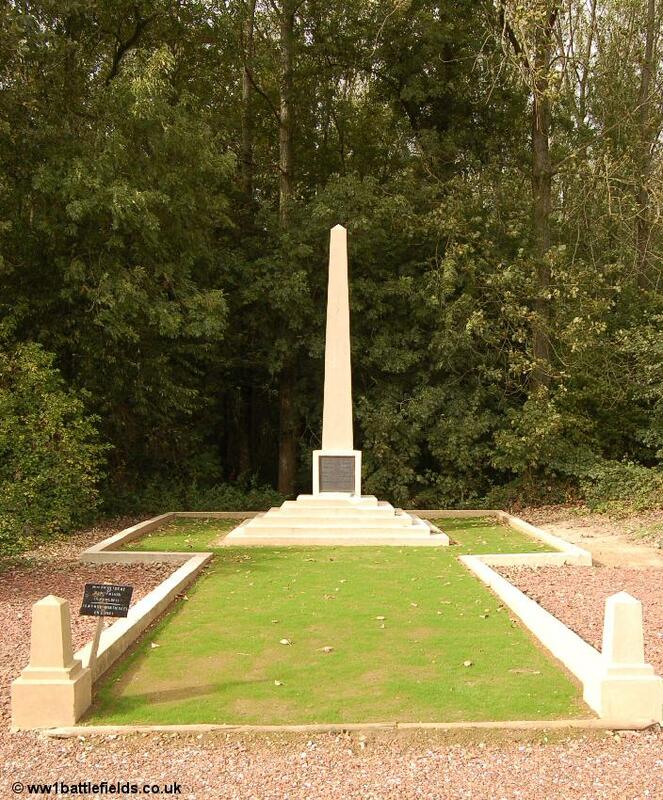 The original, a stone obelisk, was unveiled on Sunday the 4th of June 1922, by Major-General Sir Cameron Shute (who had commanded the 59th Brigade of the 20th Division during the Guillemont actions). He was accompanied by the Mayor of Guillemont and a French Army representative (General Douchy), plus men who had fought with the Division at Guillemont. 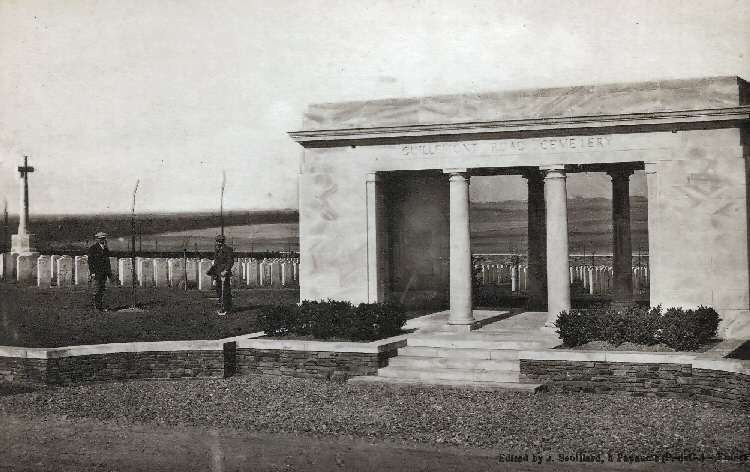 The original memorial was similar in appearance to the same Division’s memorial in Flanders, unveiled five years after the one here. The Flanders memorial can still be seen today at Langemark. The replacement memorial here at Guillemont was unveiled on the 25th of April, 1995. Further on, as the road bends to the right just before a wood, a track leads off to the left with a signpost to the Dickens Cross. (The wood to the right here is Leuze Wood, known during the War as Lousy Wood.) A visit to the Dickens Cross requires parking your car and walking a few hundred yards along the track. The area around the cross is well maintained, with shrubs around the edges and a flowerbed at the base of cross. “After 80 years the original cross that stood on this site was irreparably damaged by the elements. This replacement, funded by the Dickens family, was unveiled on Remembrance Sunday November 14th 2004 ensuring our Ceddy’s memory lives on. The original is now in Ginchy church”. The Times, on the 19th of September, 1916 (the same day it contained an obituary to Raymond Asquith, see above), carried an announcement that there would be a requiem mass for Major Cedric Dickens, at the Brompton Oratory on the 25th of September. The ‘Kensingtons’ History of the Great War contains a picture of the First battalion officers, including the (then) Captain C.C. Dickens, who looks very young. It also describes the action in which he died in some detail. An attack took place, at 4.45 p.m. on the 9th of September, with the Kensingtons in support. Major Dickens led ‘A’ Company forward, and into the German trenches. They were trying to link up with the 16th Division to their left, but the Germans still held some of their trench and were bombing them. Major Dickens was killed, presumably very near the spot where the cross now stands. ‘A’ Company of the ‘Kensingtons’ suffered badly that day; during the advance across No Mans Land, one platoon was wiped out by one large shell. The Kensingtons withdrew in the morning of the 10th of September. Like so many others, Cedric Dickens has no known grave, and is commemorated on the Thiepval Memorial. The fields around Guillemont still yield battle debris from the fierce fighting that took place here. When I visited the Dickens Cross a few years ago, in the corner of a field near the foot of a pylon not far away were several “silent pickets”, the devices used to hold up barbed wire. They were so named as the corkscrew base enabled them to be screwed silently into the ground, rather than being hammered. 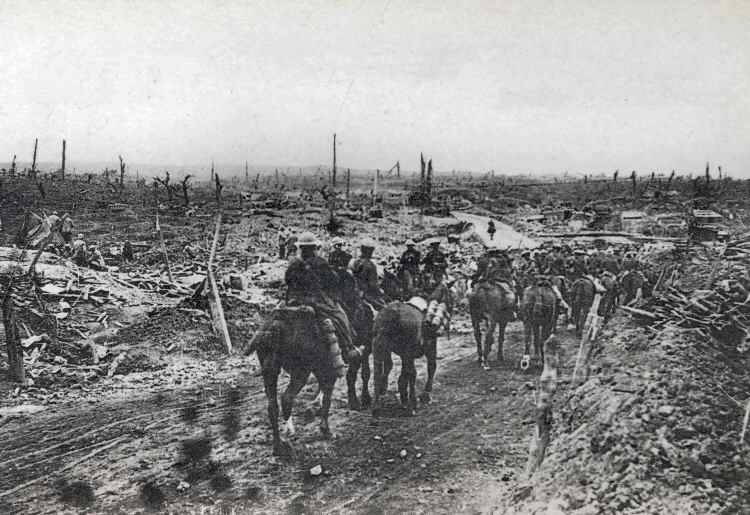 Trones Wood was one of the infamous woods on the Somme battlefields, along with High Wood and Delville Wood. 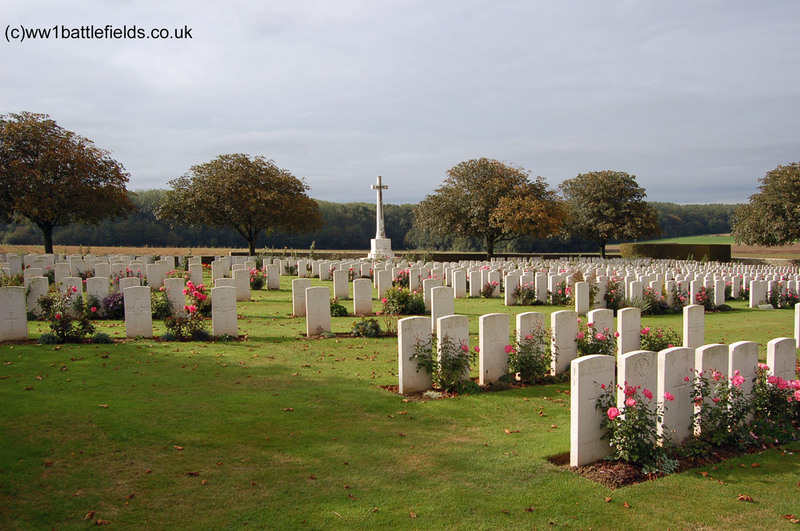 Trones Wood can be found about half a mile west of Guillemont, a little further along the D64 past Guillemont Road Cemetery in the direction of Montauban. The name Trones Wood was actually a misspelling; the French name (then and today) is Bois de Troncs. There were attempts to take the Wood from the 8th of July 1916, and on the 14th of July the 18th Division was successful in doing so. 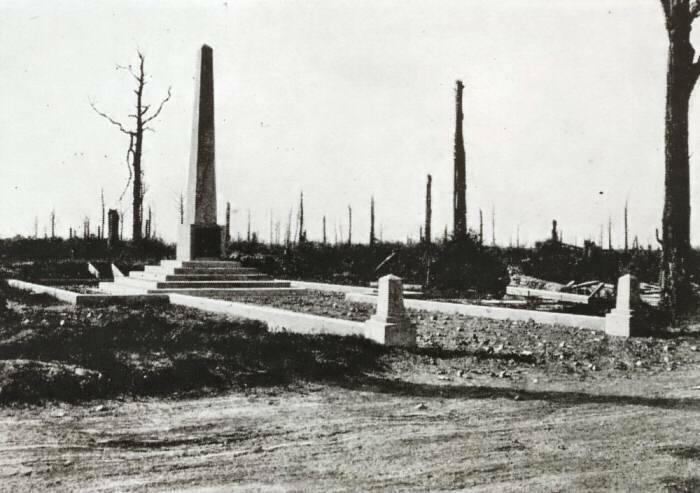 After the War, the wood was almost totally destroyed, as the picture below of graves in the wood shows. 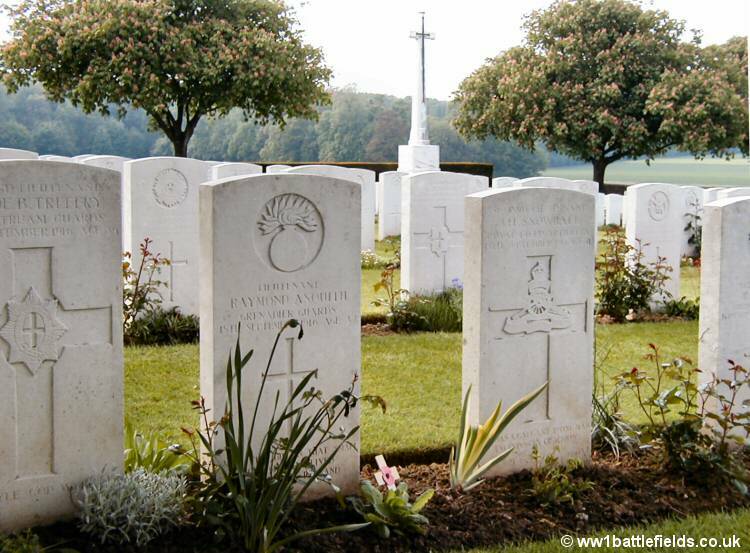 There is no war cemetery today located within the wood, so these graves were probably relocated after the armistice. At the edge of the wood by the road is a memorial to the 18th Division. 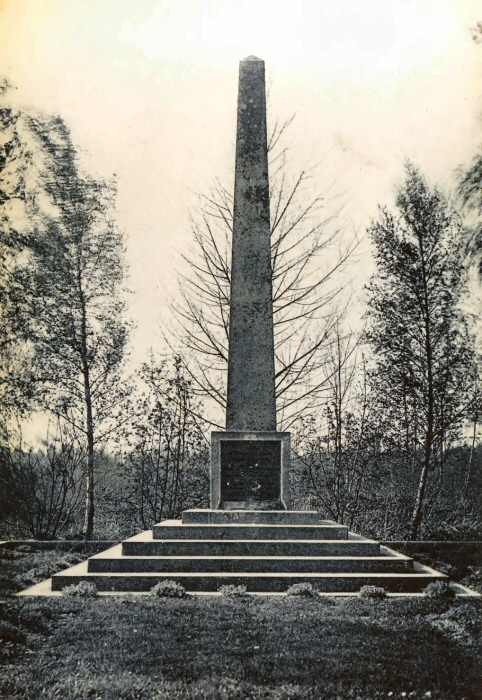 This is a tall obelisk, and the main inscription reads “To the Glory of God and in imperishable memory of the officers, NCOs and men of the 18th Division who fell fighting for the sacred cause of liberty in the Somme battles of 1916 and 1918.” Underneath are the words “The greatest thing in the world“, and below that a quotation from John Chapter 25 Verse 12. The original 18th Division memorial here was actually in the form of a wooden cross, and was one of the early permanent British memorials in the Somme. The regrowth of Trones Wood can be seen in the sequence of photographs below, showing the 18th Division memorial. The first was taken just after the War, and the shattered trees that are the remains of Trones Wood can be seen behind. Between the Wars, the wood grew back, and the second picture shows the young trees surrounding the memorial, compared with a recent view. These villages and their surrounding areas have a number of cemeteries and memorials which are worth visiting. Ginchy is north-east of Guillemont, and Ginchy church is where the original “Dickens Cross” (see earlier on this page) is now located, but the church has been locked when I have visited. On the minor road leading from Ginchy to Lesboeufs, there are two memorials. The first is the Guards Division memorial. Standing within a hedged area, this is a simple stone cross, with the inscription “In memory of those officers warrant officers, non-commissioned officers and men of the Guards Division who gave their lives to their country in the month of September 1916 in the actions that took place at Ginchy and Lesboeufs“. On the rear is another inscription, which reads “This memorial replaces the wooden cross erected close to this site immediately after the battles of September 1916.”. The Guards Division memorial was unveiled in October 1928, by Major-General Sir Geoffrey Feilding, who commanded the Guards Division in 1916. Representatives from the Guards, and from the French military were also present, as was the Earl of Cavan, who had commanded the 14th Corps of which the Guards Division was a part. The second memorial, a little further along towards Lesboeufs, is no longer accessible by a path or track from the road, and is set back about 40 feet from the road in a field. Depending on the time of year, access can be difficult due to either mud or crops. This is a memorial to Captain Herbert P. Meakin. 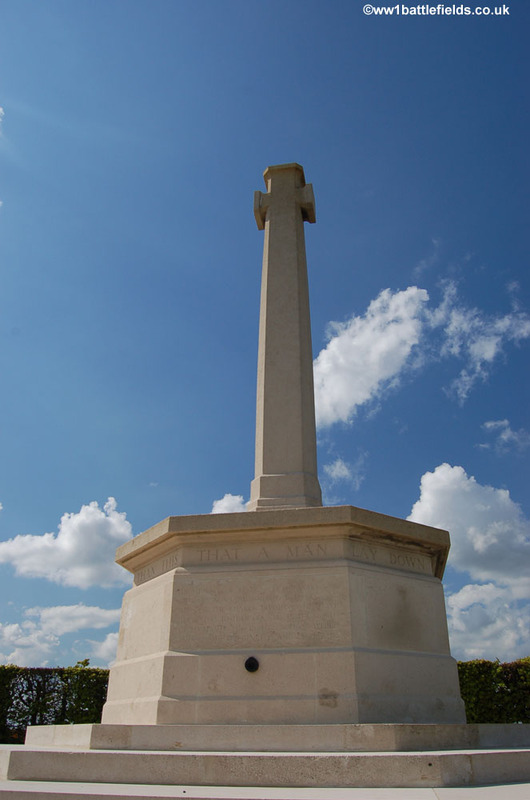 Meakin served in the Guards Trench Mortar battery, and was killed near the spot where his memorial stands. In the Middlebook’s Somme Battlefields, the authors wrote in 1991 that there were plans to restore it. 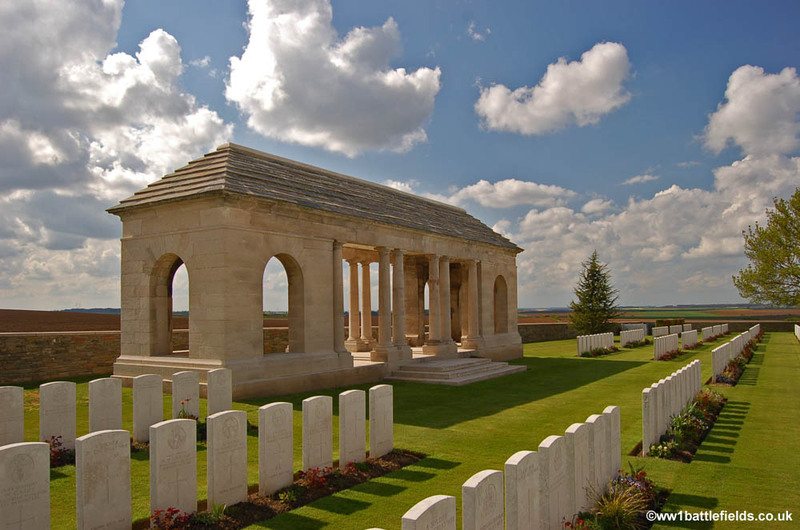 With no known grave, Herbert Meakin’s name is one of the thousands on the Thiepval Memorial. Further along, as the road drops down towards Lesboeufs is Guards Cemetery. This is one of three with the name “Guards Cemetery” on the Western Front; the other two are at Combles (not far from here) and at Cuinchy. The cemetery is set above the level of the road, with a bank and wall with entrance steps at the front. 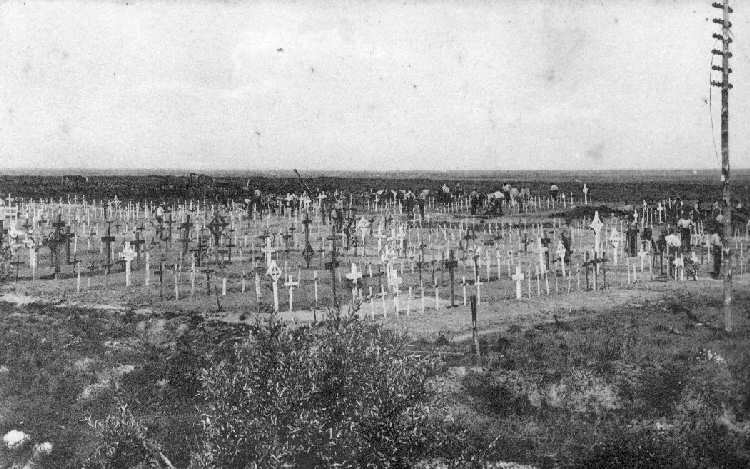 The series of photographs below show this cemetery over time – firstly shortly after the war, with original wooden crosses are still in position, and to the rear there are a number of men working – perhaps IWGC men working on the cemetery. 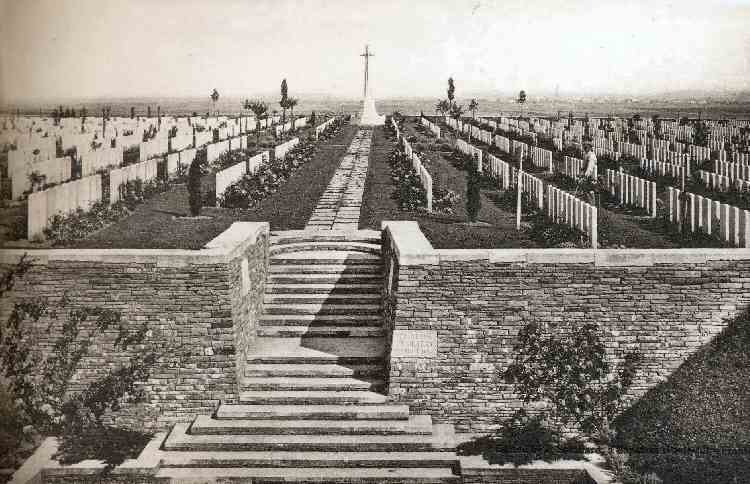 The second photograph shows the cemetery completed and the layout more or less as today. This probably dates from between the wars, and can be compared with the modern picture, taken from approximately the same spot. 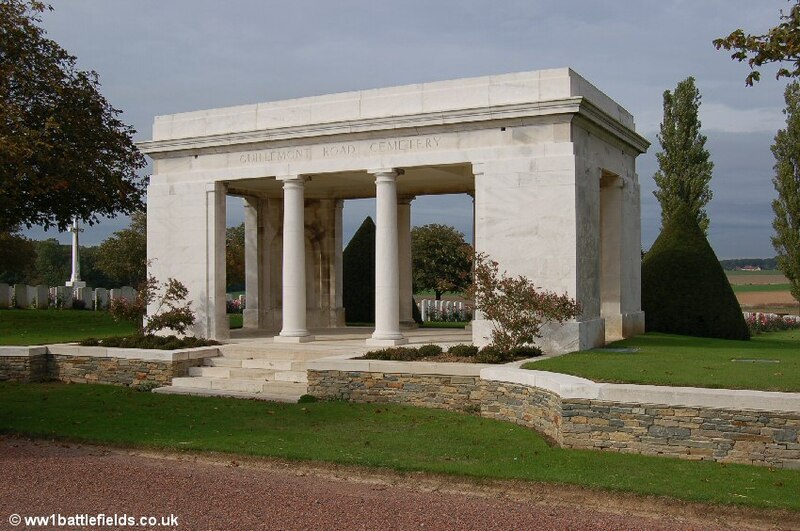 The cemetery was started during the war, with the first burials mainly of Grenadier Guards who fell in the area on the 25th of September 1916, when the Guards Division took the nearby village of Lesboeufs. 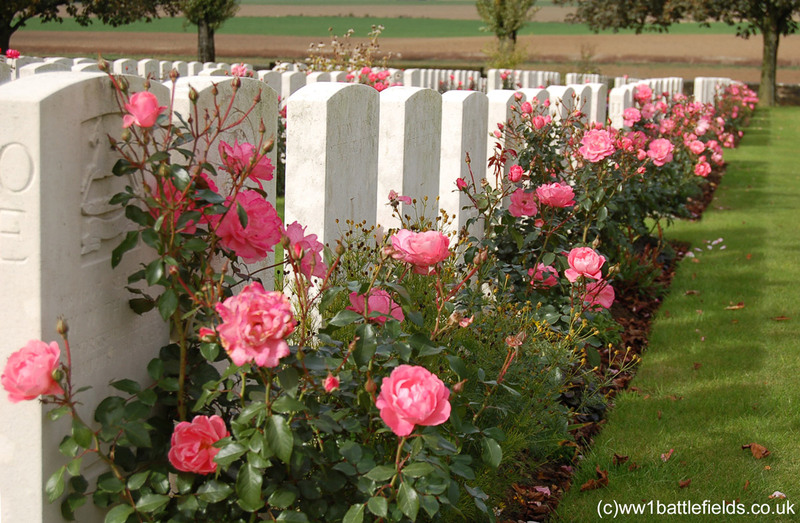 It was a small cemetery, with only 40 graves, but after the Armistice it was increased in size and now contains 3,136 graves. 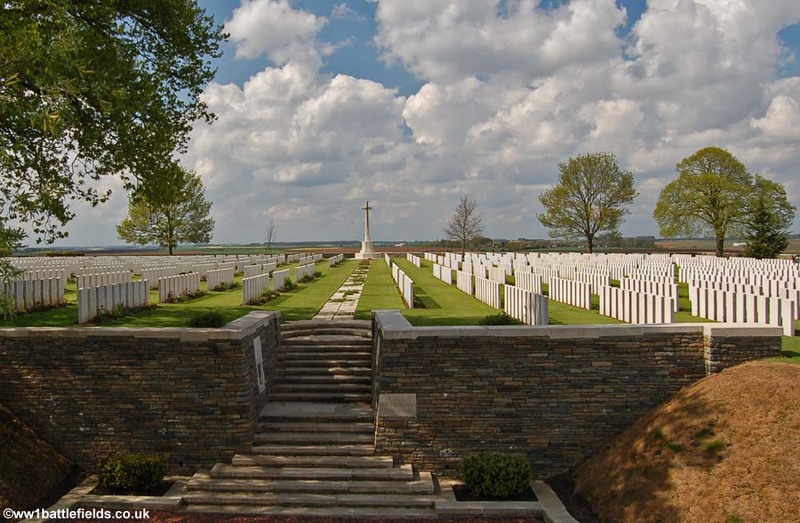 As with Guillemont Road Cemetery (see above), the fact that many of these were bodies recovered from the battlefields around, perhaps three or more years after they had died, means that less than half of the graves are identified. The original Cemetery is now Plot 1, and these headstones are at right angles to those of the later graves. 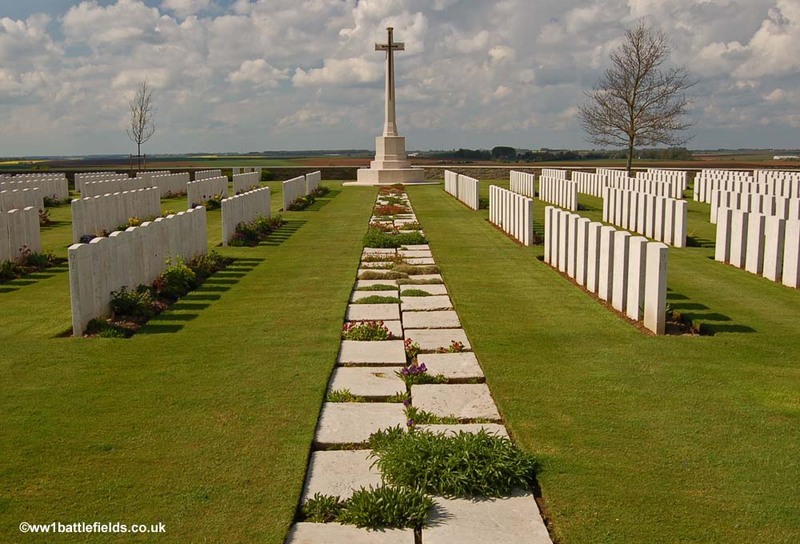 Plot 1C consists of just two graves by themselves, both Grenadier Guards: Guardsman Ernest Wilson from Manchester and Lieutenant the Honourable William Parnell, from Park Lane in London. The latter was just 22 when he died, but had won the Military Cross when in December 1915 near Le Tilleloy he entered the German trenches, killing two and taking one prisoner. Guards Cemetery is an attractive and peaceful cemetery, and the path leading from the steps at the front to the Cross of Sacrifice is inlaid with flowering plants, a thoughtful and pleasing design. Combles is around two miles east of Guillemont, and was taken on the 26th of September, after the Germans evacuated it the night before. However, during the months before that, the village had been largely destroyed, as the war-time picture below shows. As well as several cemeteries around the village, including another ‘Guards Cemetery’, there is a large bunker on the edge of the village on the road which runs from Combles to Morval.